* If you prefer, you can see a .pdf version here (2.05 Mb). Greetings from Japan. As Christmas is fast approaching, the Fall might seem like a distant memory. However, for us it has been an exciting season of ministry. Here are some of the highlights. The highlight of the Fall was the baptism of Mr. Kawano in early October. His wife, Michiyo, has been a faithful part of the church family for about 8 years, but prior to our transition to a house-style church, we had only seen him once or twice. However, once we started gathering in a home in the summer of 2012, he started to come with his wife nearly every week. From the very beginning he really enjoyed studying the Bible in small groups and participating in our discussion times. As someone who knew nothing about the Bible and was skeptical about becoming a Christian, he appreciated a place where he was free to ask questions without feeling like he was being judged. As the months passed by, it was clear that God was drawing Kawano-san to himself, but Kawano had a hard time letting God take control of his life. As a Japanese man, he was always taught the value of hard work, personal responsibility and not depending on others. This mindset was keeping him from trusting in God. However, there was still a hunger in his heart that lead him to read the whole New Testament in five months and even enroll in Old Testament classes at a local Christian college. 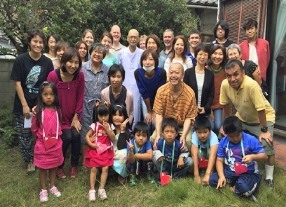 On the day of his baptism, we asked Kawano to share his testimony. He chose to do it in English, because he thought he might start to cry if he spoke in Japanese. As it turned out, he brought almost everyone to tears (especially the women!) as he shared his journey as a Japanese man coming to faith in Christ. After the testimony, we went outside for the baptism. After a time of prayer for Kawano-san, we baptized him via sprinkling (for health reasons we could not be immersed) and then the Sunday School children presented him heart-shaped congratulation cards. Of course, the whole day was topped off by a delicious potluck and a wonderful time of fellowship. It was a great day for the whole Oasis Church family. We ask that you PLEASE PRAY for Mr. Kawano. May he continue to grow in faith and in his friendship with Jesus. PLEASE ALSO PRAY for his health. A while back we mentioned that he has been battling cancer for about 5 years, and the tumors in his intestines are currently not responding well to his latest round of chemo. 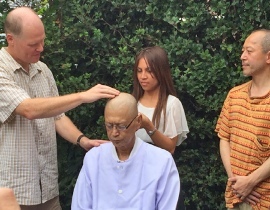 He has a great joy and strength in the Lord, but we are also praying for the Lord to touch his physical body. The Fall also saw the start of the new school year at KCS. Chris is once again working as the Bible and Homeroom teacher for the 5th-6th grade class as well as the teacher’s aide in the 1st-2nd grade classroom. She has also taken on the additional responsibility of teaching the ESL class to some of the elementary school students. PLEASE PRAY for wisdom, patience and love as she interacts with the students every day. After taking a year off from serving as school chaplain, Michael is once again helping out in that capacity. His main duty is to give the message at the monthly all-school chapel time for all of the students (grades 1 through 12!). The theme of this year’s chapel messages is “Holding On to the Promises of God.” PLEASE PRAY for Michael as he speaks to the students. May he encourage both the Christians and the non-Christians as we take time learning about the wonderful promises God has made to us. Finally, Luke started the 8th grade this year. 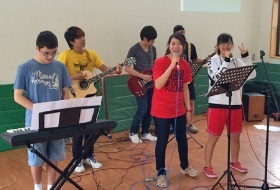 Besides enjoying his classes, Luke is also helping out with the student-led worship team. At the October all-school chapel, Luke played the piano for the worship time and then Michael came up to give the message. This was the first time for the Mason Men to work as a tag team to help the students draw near to God. PLEASE PRAY that Luke would find much joy in being on the worship team. May his piano and singing skills also improve so that God might use Luke’s musical abilities to build the Kingdom of God at KCS. Thanks again for your prayers and support as we serve the Lord in Japan. We wish you a wonderful Christmas season, and may the Lord bless you richly in 2015!